The Security Task Force for Prone Areas (Pamrahwan Task Force) Kolaksops Rem 172 / PWY-Yonif 756 / WMS managed to seize 2 M16 types of organic weapons and 1 Revolver from an armed group in the Tiom sector of Lanny Jaya Regency, Papua. "The Task Force also succeeded in securing 8 people suspected of being members of the armed group," rich Commander XVII / Cenderawasih Maj. Gen. George Supit through written statements on Tuesday (8/14). George detailed the results of the ambush against separatist groups found evidence in the form of 1 Jat shoot M16 A1 serial number SER SP 47787 (Made In Hartford.CONN, USA) 1 Pistol Revolver gun (without serial number), 13 Caliber 5.56 ammunition items, 7 points of 38 SPL Caliber ammunition, and 1 Magazen M16 A1. The Task Force also found 1 piece of assault rifle strap, 1 Gun Holster, 2 Waist Bags, 1 Charger, 1 Machete, 1 Laser Point and 7 rechargeable Laser Point Batteries and some Morning Star documents and attributes. This ambush began when the Tiom Post, which was led by the Lanny Jaya Regency Task Force Task Force, First Lieutenant Inf. 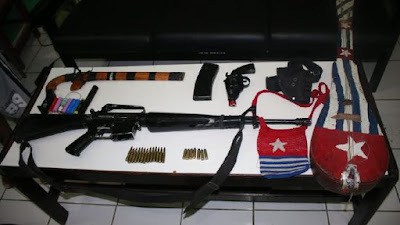 Teguh Bahtiar, got information about the activities of armed gangs who often commit theft and confiscation of plantation products, shooting pigs and seizing livestock belonging to residents. As directed by Danrem 172 Colonel Binsar Sianipar, at 2:00 a.m., Monday (13/8), the ambush of honai in Kindoni Village, Milimbo District, Kab. Lanny Jaya is done. "Activities can be carried out safely and smoothly without releasing a single shot," said George. George said the existence of this armed group had often disturbed the citizens and needed to be dealt with firmly. According to him, the government's efforts to build the Land of Papua, such as the opening of the Trans Papua road, the Bright Papua Program by PLN and several other development programs, are always hampered by a handful of people who do not want the progress of Papua. "I appreciate the achievements of Battalion 756 / WMS soldiers, I invite the whole community to create a conducive situation in the face of the 73rd anniversary of Indonesia's Republic of Indonesia," concluded George.